Happy Monday! For those who celebrated, I hope you had a wonderful Easter. We did and the weather couldn't have been more perfect. I was so excited to enjoy a warm and sunny day! Today's dinner is a spicy favorite of ours that goes great over rice or noodles and of course I think everything is better with cheese. Especially cream cheese! If you are a spicy cream cheese lover then be sure to give this recipe a try! Arrange chicken in bottom of slow cooker. Sprinkle with garlic powder and toss in the green chiles and jalapeno. Meanwhile, in a small bowl combine cream cheese and milk. Whisk until combined and pour over the chicken. Cover and cook on low 3-4 hours. About 15 minutes before serving add in the cooked bacon and shredded cheddar. Serve over rice or noodles. Enjoy! 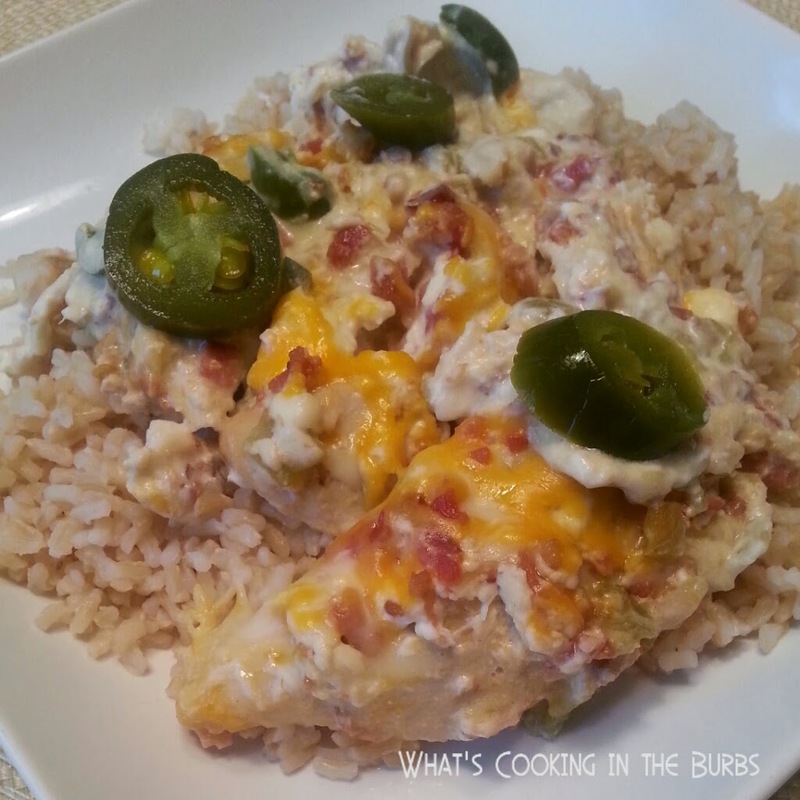 I am not sure what I love the most about this recipe - that it is a slow cooker recipe or that it has jalapeños! Thanks for sharing at the In and Out of the Kitchen Link Party! See you next week! OH YUM!! Lovin' the tex mex with bacon!! Thanks again for sharing at Simple Supper Tuesday.